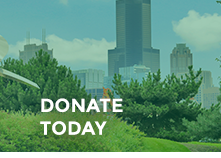 One of Chicago Gateway Green’s most established and beautiful Expressway Gardens, this site surprises commuters as they drive past a sweep in the expressway and see the extensive, hardy plantings. These plants include broad strokes of Prairie Dropseed and Little Bluestem grass, along with ‘Double Knock Out’ roses and large sections of Miscanthus ‘Morning Light’ grass. Punctuated within the site are flowering shrubs and several large, mature trees including some graceful Hackberry trees.